Context is key in working our way towards solutions to our housing crisis. As we determined how to set future policy, we must understand how affordability has fluctuated in our region in recent history. These maps (created by the Portland Housing Center and ECONorthwest) give you a bird's eye view of affordability, displacement, and owning versus renting in the Portland metro region since 2000, including a projection of what is expected--under current conditions--in the year 2020. 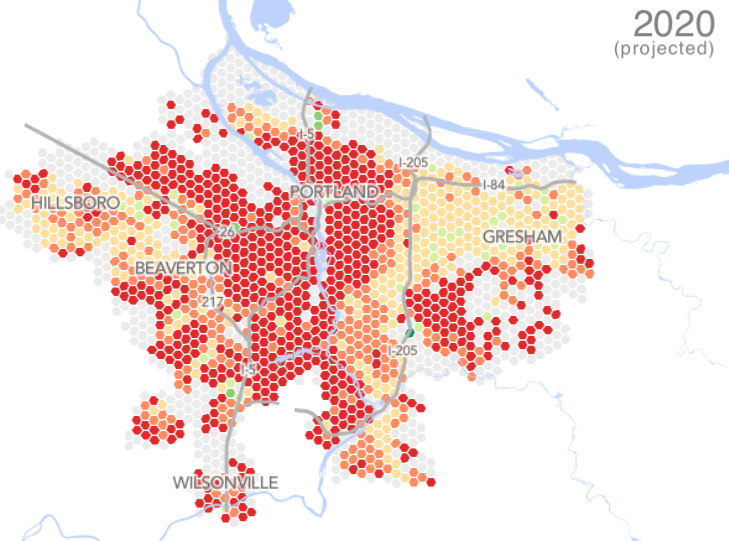 Click here for a history of affordability and displacement in Portland. According to The Institute for Policy Studies, the wealth divide between White families and Latino and Black families in the United States is growing at an alarming and unchecked rate. Over the next twenty-five years, this wealth divide will likely double. That means that the current difference in average family wealth – about $500,000 in 2013 – will grow to become a gap of more than $1 million. "If average Black family wealth continues to grow at the same pace it has over the past three decades, it would take Black families 228 years to amass the same amount of wealth White families have today. That’s just 17 years shorter than the 245-year span of slavery in this country. For the average Latino family, it would take 84 years to amass the same amount of wealth White families have today—that’s the year 2097." One of the most significant drivers of racial wealth inequality has been unequal experience of home ownership. For a variety of reasons, Black and Latino families have been historically less likely to become home owners. As a result, they have not built wealth that can be inherited by their children and grown across generations. Additionally, those who have been able to become home owners have been more exposed to predatory lending and turbulent housing markets than White families. This national story about race and home ownership is playing out in the Portland region right now. Much of the Portland Metro region, especially neighborhoods closer to Portland’s city center, has become increasingly less affordable since 2012. Portland Housing Center commissioned a study and data visualization tools from EcoNorthwest to better understand the scale of the problem our region faces – and to help share this troubling data with civic leaders and policy makers. Click here to see interactive affordability maps. The maps below represent the affordability of available housing stock for a household earning the region’s median family income. Areas shaded green are considered affordable for these households. Areas shaded red are considered unaffordable. Over time, affordability changes as incomes, interest rates, and home sales prices change. Over the last several years, home ownership has become out of reach for many families. If current trends continue, it is likely homeownership will be largely out of reach by 2020. This leaves many Black and Latino families in Portland with no opportunity to become home owners close to jobs, schools, public parks, and the social and financial center of the city. Portland Housing Center (PHC) believes everyone deserves access to homeownership. PHC makes it possible through quality home buyer education, one-on-one guidance, financial services, and additional diverse resources to make homeownership a reality for Portlanders. PHC has helped more than 7,000 families become successful, financially secure homeowners; guiding them throughout the home-buying process. PHC offers mortgages with fixed interest rates, low down payments, and assistance with down payment and closing costs. Homeownership provides financial stability. The equity people gain in their homes is a critical source of funding for higher education, starting businesses, and paying medical bills. Homeownership empowers individuals and families by providing a sustainable asset, and Portland benefits when residents make an investment into Portland’s future. HOW DOES PHC FIT INTO THE CURRENT PORTLAND HOUSING LANDSCAPE? As the housing crisis in Portland continues to impact local families, Portland Housing Center is committed to ensuring safe, affordable housing for all. The changes happening in our city are pushing more and more Portlanders to the edges. Homeownership is a critical source of stability and opportunity, for young families and for workers like teachers and nurses who support our communities. Portland Housing Center is facing this crisis head-on, leading the way to ensure affordable homeownership is a central part of our community’s response to the housing crisis. "The contrast between the Recession trough just 5 years ago and today is sharp. According to Zillow, a person looking to buy a home in 2011 would be looking at a median list price of around $195,000. If they were looking today, that median list price would be $369,500 – almost a 90% increase."